Asa Butterfield, Chloë Grace Moretz, and Ben Kingsley star in a film written by John Logan, based on the book The Invention of Hugo Cabret by Brian Selznick, and directed by Martin Scorsese. Martin Scorsese enters family-friendly turf with <em>Hugo</em>, a visually impressive if somewhat disjointed ode to silent film starring Asa Butterfield (above) as the clock-tending title character. By rights, this ought to be an important film: a valentine to the history of cinema from an undeniable part of its grand chronicle. Hugo presents the story of how Georges Méliès (Ben Kingsley), the inventor of fantastic film, was “rediscovered” by children. Better yet, it takes the form of an ostensible kiddie adventure movie, made by none other than Martin Scorsese, the poet of the mean streets. Of course, it doesn’t work, but you may find it hard to resist the passions surrounding this doomed effort. The problem is Hugo’s hybrid nature. 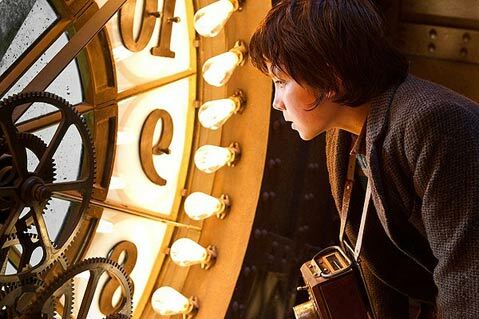 Two movies overlap here: the first concerning Hugo (Asa Butterfield), a boy who lives in the walls of a Paris train station and tends to its big clocks, all shot in dramatic, antique-looking 3-D and made to resemble Scorsese’s signature long tracking shots. This film tries so hard to convince us of its artistry, using gears and automatons as major motifs, and yet it sprawls in clumsy fashion into another movie, a lecture on the history of silent films. The parts dovetail, but soon we realize that not much has happened and none of it moved like clockwork. But the experience is ravishing. Scorsese loads every scene with detail, the same devil that drove The Age of Innocence like a grand time machine. When Hugo edges out on a clock tower way above Paris, holding onto the giant minute hand (à la Harold Lloyd), we see the steel surface dusted with icy snow and feel its slippery dangers. The re-creation of Méliès’s studio is gorgeous, too: a dream sequence involving trains and clockwork people that will haunt you days later. But Scorsese tries too hard — like he did in Gangs of New York and Shutter Island — for effect without depth, and it’s not really meant for kids. In the old days, Scorsese made movies from within that may have meandered but always connected. Some critics have called this his most personal work, but aside from the obvious love of film he exhibits, you’ll probably prefer he leave the big train station of history and get back to the streets.